The global allergy-relieving eye drops market has been segmented based on drug class, type, distribution channel, and region. In terms of drug class, the global market has been classified into antihistamines, non-steroidal anti-inflammatory drugs, vasoconstrictors, and others. The antihistamines segment dominates the allergy-relieving eye drops market, in terms of value. The wide acceptance of antihistamines as the first line of treatment for allergic conjunctivitis is likely to drive the segment. Furthermore, increase in the prevalence of allergic conjunctivitis and rise in awareness about eye-related disorders are anticipated to propel the segment during the forecast period. This segment is also expected to expand at a significant CAGR, owing to its effectiveness in the treatment of ocular allergy. The vasoconstrictors segment follows the antihistamines segment, in terms of share, of the global allergy-relieving eye drops market. The dominance of the segment is attributed to the extensive utilization of vasoconstrictors to relieve redness of the eyes associated with ocular allergy. In terms of type, the global market has been classified into seasonal and perennial allergic conjunctivitis, vernal keratoconjunctivitis, atopic keratoconjunctivitis, giant papillary conjunctivitis, and others. The seasonal and perennial allergic conjunctivitis segment is likely to dominate the global allergy-relieving eye drops market during the forecast period. In terms of distribution channel, the allergy-relieving eye drops market has been segregated into hospital pharmacies, retail, and online sales. The retail segment held a major share of the market in 2017, followed by hospital pharmacies. The retail segment is expected to maintain its market share during forecast period due to the availability of both prescription as well as OTC drugs for allergic conjunctivitis. The online pharmacies segment is projected to expand at a considerable CAGR during the forecast period, owing to easy availability of drugs at home at a discounted price and long-term treatment required for certain form of ocular allergies. In terms of region, the allergy-relieving eye drops market has been segmented into North America, Europe, Asia Pacific, Latin America, and Middle East & Africa. North America dominates the allergy-relieving eye drops market, owing to the high awareness about minor eye-related disorders in the U.S. and increased prevalence of allergic conjunctivitis in the region. 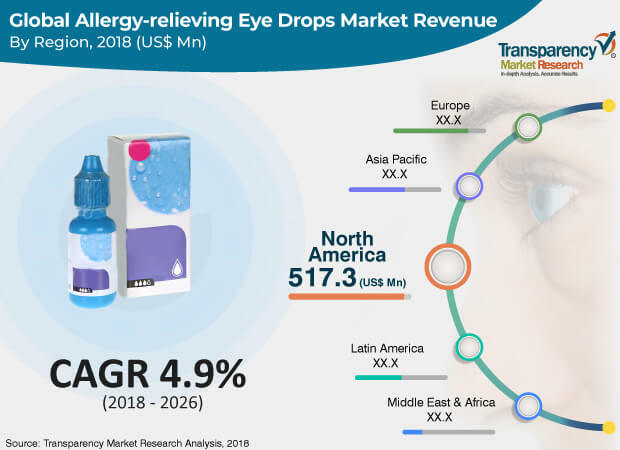 Moreover, North America is anticipated to be a highly attractive market for allergy-relieving eye drops during the forecast period, owing to the high cost of prescription drugs and a significant number of people in this region covered by medical insurance. Major players operating in the allergy-relieving eye drops market include Allergan Plc., Johnson & Johnson Services, Inc., Pfizer, Inc., F. Hoffmann-La Roche Ltd., Novartis AG, Bausch Health Companies Inc., Regeneron Pharmaceuticals, Inc., and Santen Pharmaceutical Co., Ltd. Key players are expanding their product portfolios through mergers & acquisitions and partnerships & collaborations with leading pharmaceutical companies, which is expected to increase the product availability and thereby boost the market.